Periodically as you walk about the convention center, you have to pass through set-ups that look like subway turnstiles without the turnstiles and you must "tap in" or "tap out," tapping your badge where specified. It's not a hardship, though those of us who are over six feet in height have to stoop a bit to make the tap. I am wondering if in addition to verifying that your badge is valid if it also yields info about how long you remained at the con, where in the building you roamed, etc. The fact that people had to "tap in" essentially confirms they are indeed passive tags with a very short range. 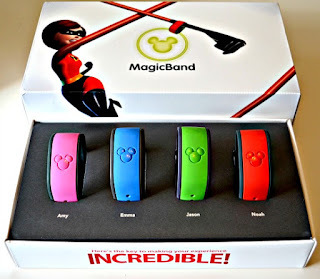 Somewhat akin to Disney's "Magic Bands" that I talked about over at FreakSugar last year. But that they set up those check-in points also all but confirms they are indeed doing some tracking of attendees within the show. Kerry Dixon, over at the Unofficial SDCC Blog caught that attendees will also need to make sure they "tap out" as they leave the show or they wouldn't be able to return. That, to me, sounds like a logistical problem on their end. Disney is using the same technology, after all, and has no such "tap out" requirements. The only reason I can think of for this is to assess how many people are on the premises at any given moment for the purposes of remaining under capacity limits from regulations. Disney, I'm sure, has to adhere to those as well (indeed, I've seen where they stop admitting people to their parks) but I suspect that Disney has better metrics/algorithms on how long people stay on site, and possibly limits capacity well before they hit any legal thresholds in order to make sure the park doesn't get uncomfortably crowded. It will be interesting to watch how shows continue to utilize and take advantage of this technology going forward, and how many other shows pick up on the same ideas.